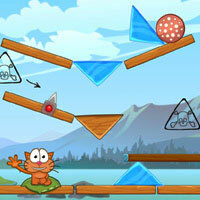 A fun physics puzzle game for mobile phones to play online for free. Help the cat to get the tasty salami slice. Interact with objects to remove them and deliver the salami to cat. Earn stars by completeng levels in shortest time.